2010 NFL Odds & Predictions: Carolina Panthers Lacking Bite in 2010: The Carolina Panthers head into the 2010 NFL picks season with 30-1 NFL odds of representing the NFC in the Super Bowl, Vegas NFL predictions are on a rebuilding season for the Carolina Panthers. With Jake Delhomme no longer in Charlotte to kick around anymore, Panther fans will need to find a new whipping boy. Delhomme’s fall from championship quarterback to the wobbly player who lost his confidence and touch was as alarming as it was swift. The Panthers also said good-bye to DE Julius Peppers, WR Muhsin Muhammad, FB Brad Hoover, and a number of established players. Say hello to a new era in Carolina as the Panthers take a run in this years 2010 NFL odds matchups. Matt Moore is now the starting quarterback and he did well in limited action in 2009, as evidenced by his 8 touchdowns against only 2 interceptions. He will have to prove he can do on a regular basis, though, in 2010. For the 2010 NFL picks season the Panthers have a powerful and diverse running game, and, at least in the early going, will rely heavily on doses of Jonathan Stewart and DeAngelo Williams. The combo produced over 2,200 yards in 2009 so defenses will be concentrating on stopping the ground game even more in 2010. Steve Smith returns to lead the passing game and, when healthy, is one of the best in the game. Staying on the field has been a challenge for Smith in recent campaigns, though. Carolina’s defense is also in transition. John Fox’s “D” must find a way to compensate for the loss of Peppers and two other D-line starters. Jon Beason leads a group of young linebackers, and the corners are solid in Chris Gamble and Richard Marshall. If they are to beat the NFL odds in 2010, the unproven Panthers will need contributions from a number of young players and make sure their punishing ground game stays in high gear. 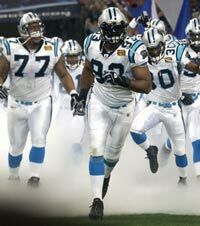 Can the carolina Panthers make an impact in the 2010 NFLpicks season? Then bet on the Panthers to make the 2011 Super Bowl picks matchup at Bodog.com and take advantage of their NEW BONUSES! The Vegas style online sportsbook is now taking NFL predictions on everything NFL, including your selection on who will win the 2011 Super Bowl. Whether you plan to Bet the Carolina Panthers or anyone else Bodog.com has got your game.